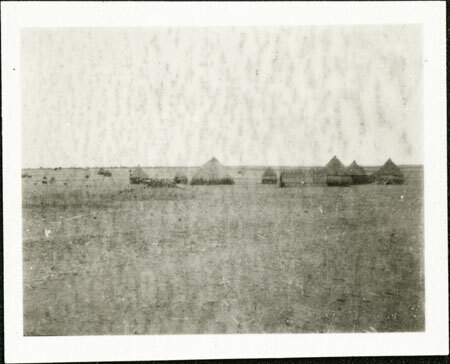 A Nuer homestead situated on a plain, including a cattle byre (luak), pile of firewood, fenced enclosure and several huts of differing size. Some huts of other homesteads can be seen in the distance. It is possible that the location is the Nyanding River area, where Evans-Pritchard began initial fieldwork among the Nuer Lou in 1931. Note on print reverse ms pencil - "1 201 "
Morton, Chris. "Nuer homestead" Southern Sudan Project (in development). 03 Jan. 2006. Pitt Rivers Museum. <http://southernsudan.prm.ox.ac.uk/details/1998.346.201.2/>.